While all three have seen their market caps drop over the past few days, note below that Tesla’s (TSLA) recent move higher on the “$420” news leaves its market cap higher than both Ford (F) and General Motors (GM). Back in early 2013, Ford and GM both had market caps around $50 billion, while Tesla was at just over $2 billion. Ford saw its market cap top out around $70 billion in mid-2013 and mid-2014, but since then it has been steadily dropping lower. 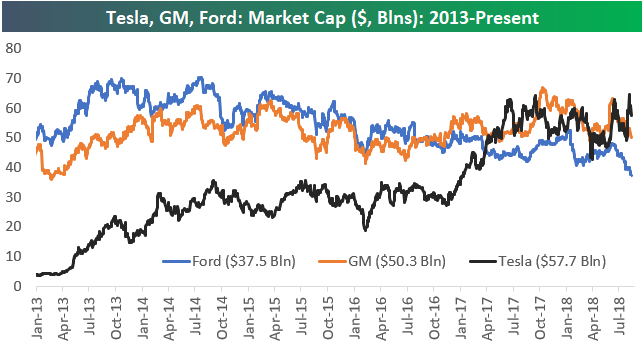 At this point Ford has lost nearly half of its market cap in the last four years. The market cap for GM has been much steadier over the past few years right around the $50 billion level. The US automakers aren’t the only ones struggling. Automakers globally have been trading terribly in 2018. Below is a table of the major automakers around the world (from the S&P 1200 Global Autos group). 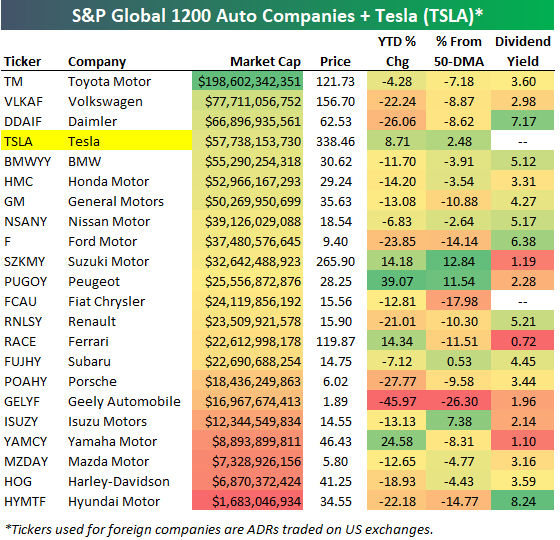 We’ve included Tesla (TSLA) in the table as well even though it’s not in the group. Of the 22 stocks listed, 17 are in the red year-to-date. Along with Tesla, the only ones in the green this year are Suzuki (SZKMY), Peugeot (PUGOY), Ferrari (RACE), and Yamaha (YAMCY). With all the share-price weakness for autos, dividend yields have gotten pretty elevated. Hyundai now yields over 8%, Daimler yields 7.17%, while BMW, Nissan, Ford, Renault, and Hyundai all yield more than 5%. 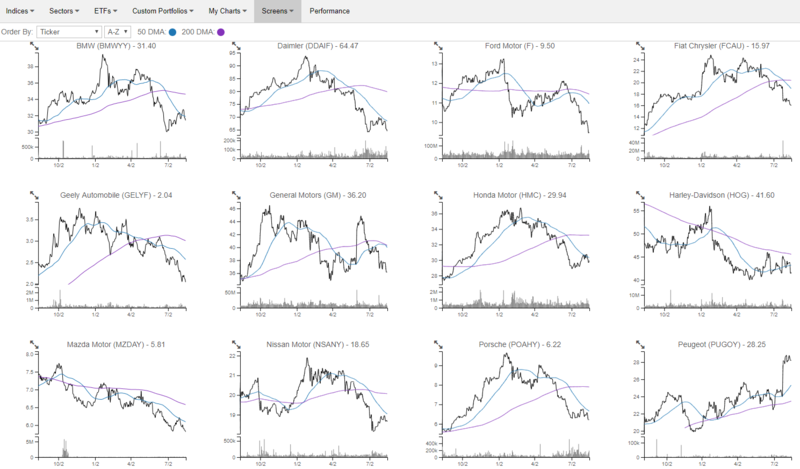 If you haven’t used our Chart Scanner tool, we’ve created a portfolio of the global automakers shown in the table above so you can easily see how horrible most of their chart patterns look. Our Chart Scanner lets users quickly and easily browse through dozens and dozens of charts in mere seconds to identify broad trends (like weakness across autos) or find charts that look bullish or bearish. (We provide a snapshot below.) If you’re a Bespoke Premium subscriber or higher, you can click on the charts to mark them as bullish or bearish, and we’ll save them all for you so you can come back to them whenever you want. Go ahead and check out the autos in our Chart Scanner now. If you’d like to unlock the full version, you can start a free trial to Bespoke Premium.